For this year, unlike in the previous years, I've decided to make my own inserts for my filofax. Well, I actually wanted to make my own inserts last year, but since I had to buy myself a new planner because my first one's clasp ripped, and this new planner came with insterts already, I decided to use what was given, and so left the printing out and planning of the new inserts for this year. As you can imagine, my current planner - a black Identity, Personal Size Filofax - is holding quite well, showing some damage, but still functional, and thus it received the grace of my own design. Now, I say "my own design" and it might sound something superb, very creative, full of visuals and very personalized. It's not. I mean, not like I could actually do it - I've friends like Tina and Arjen who take all the credit for creative, visually beautiful work, but that's not one of my talents - though I did make some inserts for a friend of mine inspired entirely on Doctor Who and Star Treck. But no, when it comes to planners, I've discovered that what I need is a minimalistic design (and I'm not minimalistic in any other area of my life). The smaller possible letter, the thinner lines, the less possible clutter. I will fill up the pages well enough with all the things I write and stick and stamp into them, I don't need the basic design of the inserts to add more bulk. In a way, that was something I didn't like about the standard Filofax inserts: too many languages, too little space of the weekends, and the Sunday was lost with the corner monthly calendar. Yes, a lot of people rest on Sundays and weekends, but not me. Well, maybe I rest on Sundays (some), but my Saturdays are very busy. From the extra day to go to the gym, my Archery lessons, THE Day to meet with my friends, run errands, check on my P.O.Box, and then Sunday is the official Movie Day when it can't happen any other day, my Mall Day, my Bookstore Day, my Fill The Car's Tank Day, and even my "special diet day" when my nutritionist issues such a rule (because I've been stuffing my face with chocolate and gained weight instead of loosing it? Yeah). Yes, there are other types of inserts, even even-spaced Wo2P inserts, but why should I go with that when I can make my one in one language and the language I choose? This year I went for Hungarian with some notes in Spanish, and other inserts in English. Yep, that's me and I like it. Anyway, since I'm trying out my own inserts, getting used to the slightly smaller space for week-days, I decided to try out something I haven't used since 2013: the Chronodex. I'm still sticking to my own design, though instead of starting my day at 5 a.m., I decided to start it at 4 a.m. since I'm waking up daily at 4.30 (or try) in order to squeeze 30 minutes of exercise at home. 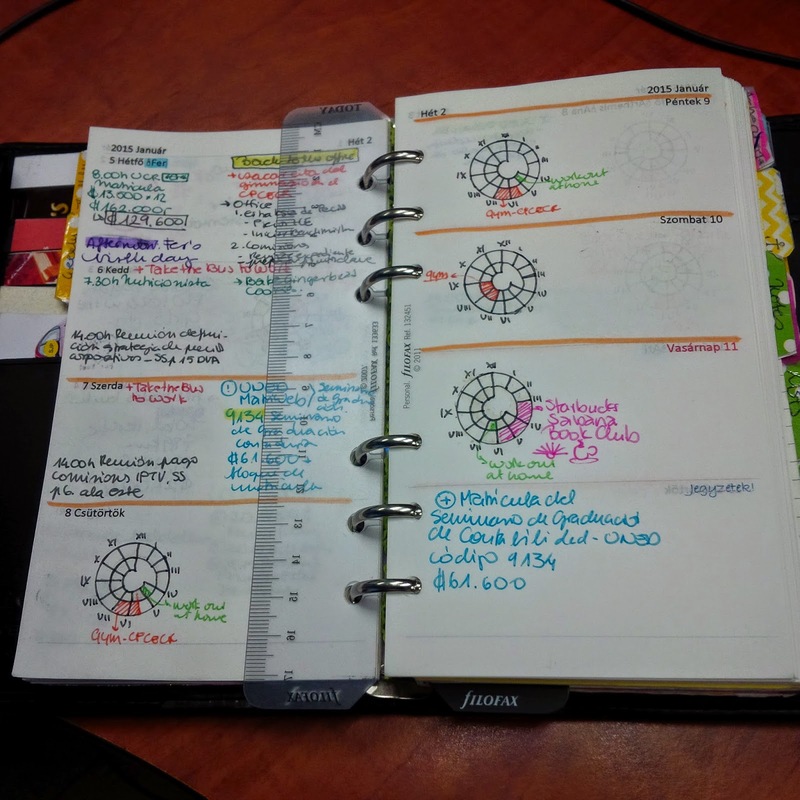 I want to make my design into a stamp, so I don't have to hunch over my planner for several minutes drawing the chronodex when I need it. 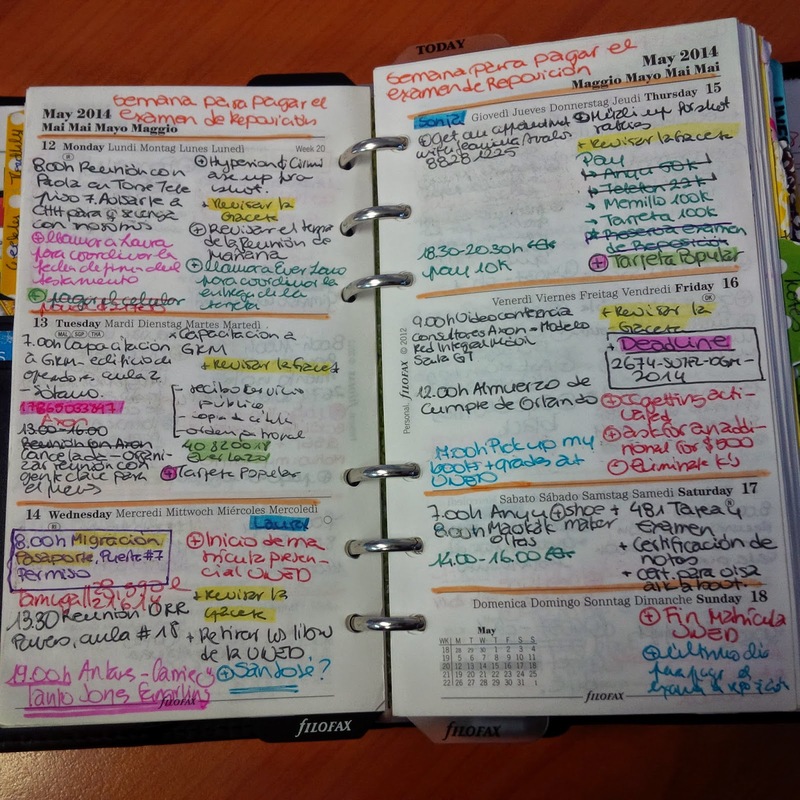 The idea behind it - going back to the chronodex on an on-and-off basis - comes as a way to organize my day when I have several time-bound activities but those require little added detail. Gym appointments, my archery, meeting with my friends, periodical meetings and such. I still make sure to leave space for my "tasks" area of the day, and won't use the chonodex for more complex notations, like when I need to write down an appointment or a task with specific directions, notes on what I'd like to focus on, or even when I need to pen in the address of the place. The chronodex simply doesn't cut it for that, but for other things, it does give me a much cleaner, clearer view of my time. And I like it how it looks. Anyway, it's an experiment, I've used it before and I know when it works and when it doesn't, so why not give it another try in this new year? Let's make it work.